There’s something quite Aussie about spending the weekend away at the beach. We’re blessed with some of world’s most amazing beaches and our relaxed coastal homes reflect this laid-back, outdoor living. While this turbulent weather might make a beachside stay unlikely right now, there’s never a bad time to ogle at stunning beach house designs to get you inspired and lusting for the holidays. 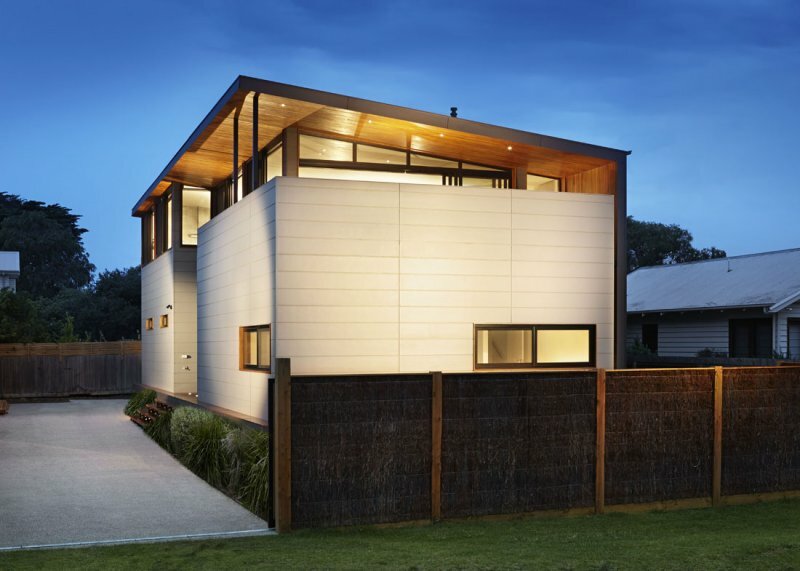 These six modern beach homes are sure to impress(or may just encourage you to add a touch of the coast to your inner city home). 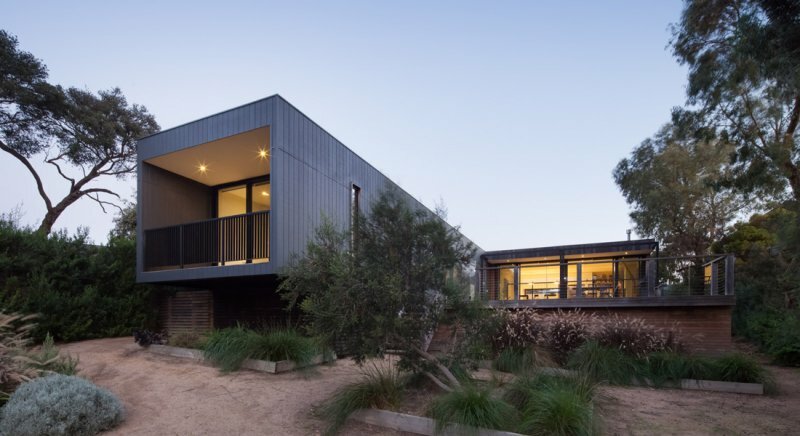 From functionality through to aesthetics, the Merricks Beach house is truly exceptional. Sleeping up to 14 people, this large beach house has plenty of space for the whole family. The floorplan offers a brilliant combination of zoned living and accommodation spaces. The rumpus room, complete with bunk beds, stands separate from the main house but is linked via a series of tiered decks and provides a perfect getaway for the children. The kitchen has been cleverly designed to open onto both the open plan living/dining area as well as the enclosed and protected courtyard via a servery window. The kitchen can be hidden from the main living area thanks to sliding doors that compartmentalise the space when required. A gorgeous Chiminee Philippe fireplace takes centre stage and provides a lovely warmth and ambience during the winter months while the highlight windows allow for a consistent level of natural light throughout the day. Exceptional design flair and brilliant functionality combine in the modern beach home at Point Leo Victoria. 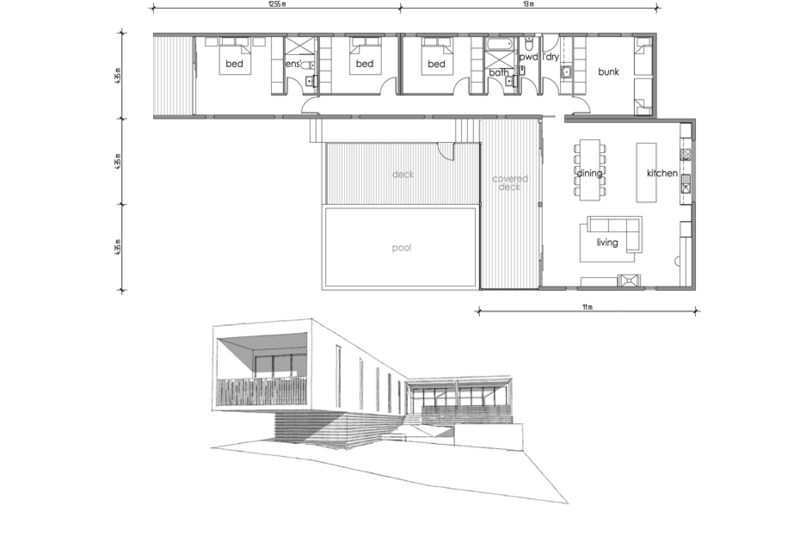 Offering bountiful space for indoor and outdoor entertaining, the Point Leo beach house orientates towards the street on the ground floor while the first floor cranks towards the ocean. The kitchen becomes the focal point in the home. Whether inside or outside the kitchen bench traverses both spaces and seamlessly integrates the interior and exterior living zones. 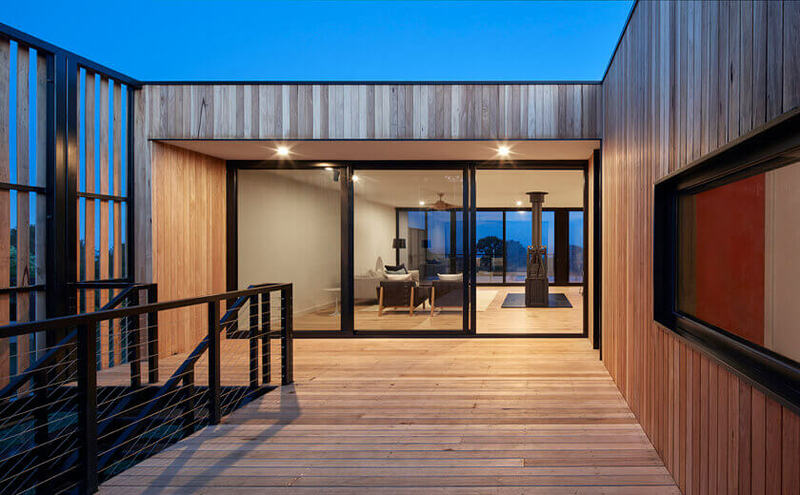 The dark stained Pacific Teak timber cladding ensures that, despite its contemporary nature, the home looks very much at ease in its natural seaside environment. Orientated to enjoy the dramatic views across Western Port Bay, the Shoreham beach house provides all the essentials for a beachside getaway. 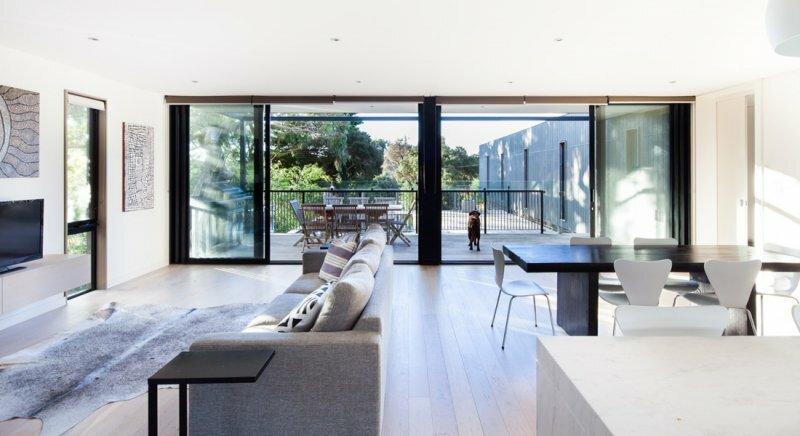 The clients’ brief was to capitalise on the beautiful sea views, thus the main living space is elevated to the first floor and extends onto a rear deck through a bank of floor-to-ceiling glass stretching across the width of the house. With ocean views from the rear deck facing south, a secondary outdoor area was constructed to take full advantage of the northern sun. 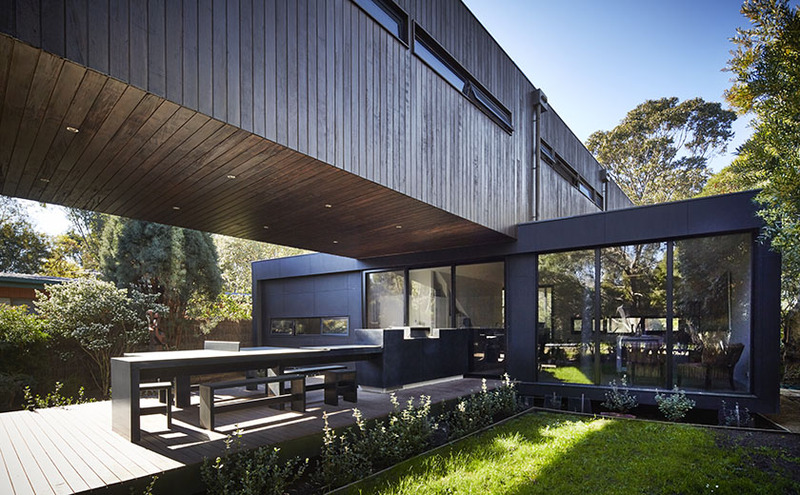 Vertical timber battened screens sheltering the courtyard provide privacy from the street while still allowing sunlight to penetrate deep into the house. 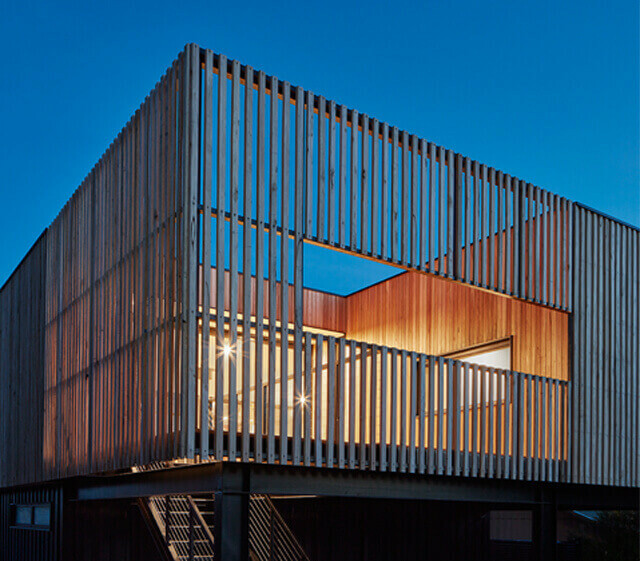 A large outdoor entertaining area is an essential item in many great modern beach homes – and our modular holiday home in Barwon Heads is no different. 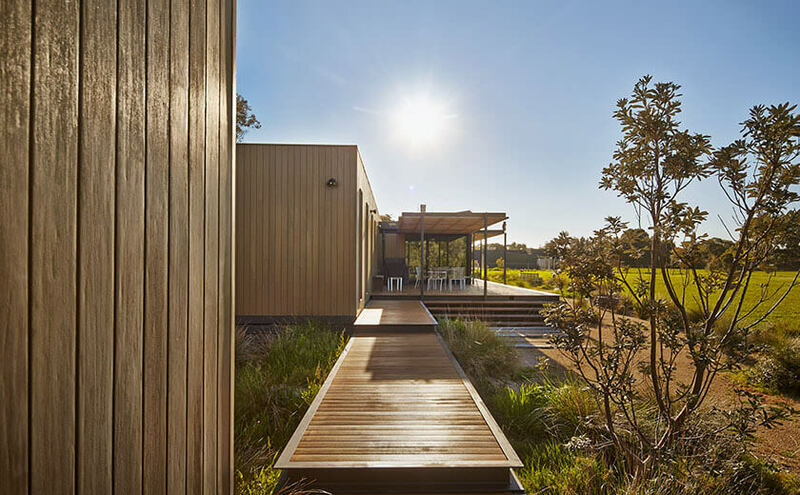 The sophisticated and environmentally responsive Barwon Heads holiday home offers various spaces to gather and to relax. Downstairs is the children’s domain, complete with rumpus room large enough for a pool table. Upstairs a generous open plan living space effortlessly opens up to a large entertainer’s deck. 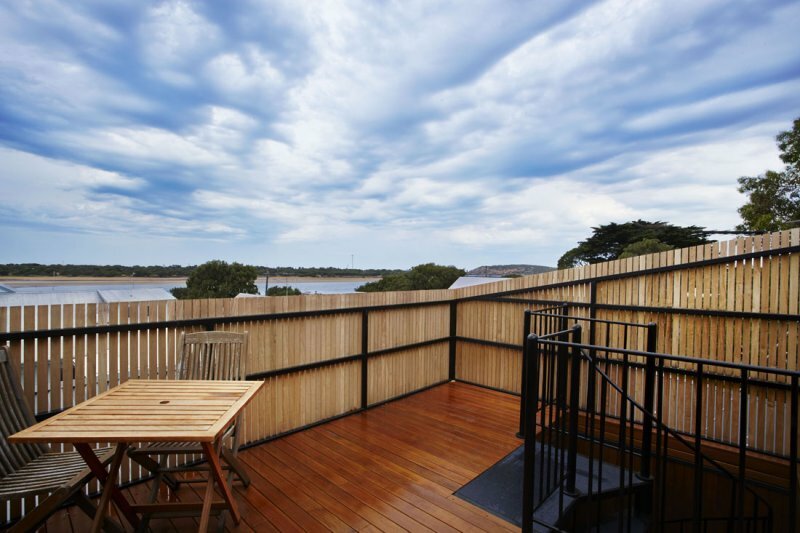 To capture the wonderful views of the Barwon River, the luxurious modular home offers a private rooftop deck – perfect for some reflective downtime. 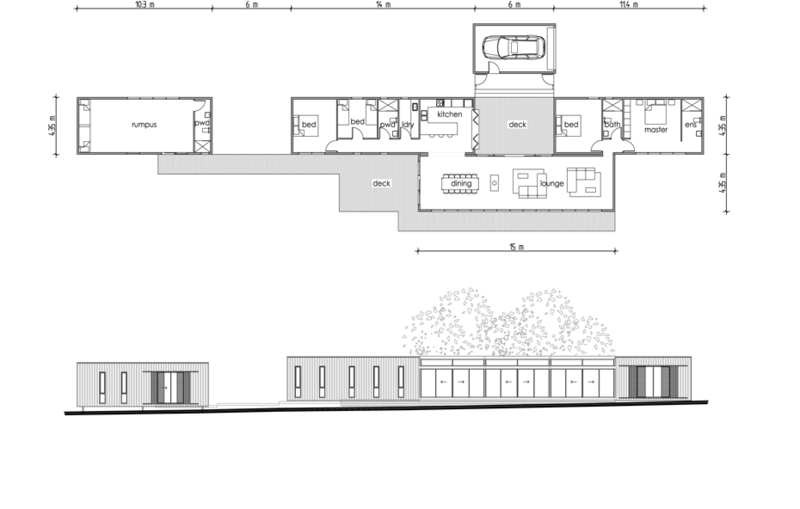 The Portsea prefab home is blending with its surrounding environment and will continue to age gracefully over time. As a weekender and holiday home, relaxation is key – thus the simple dark form is fuss-free and requires very little maintenance. Holiday life is centred around the pool and the outdoor living spaces – all of which are orientated to the north for all-day sun. The deck and pool become an extension of the indoor entertaining spaces with its positioning allowing it to become a place to relax in the sun, a gathering place to enjoy the company of friends and a perfect position to keep an eye on the kids at the same time. Ok you can stop drooling now. As beach house builders in Victoria the Modscape team are more than happy to discuss your next holiday home project or you could visit our Instagram page for more inspiring imagery.